Last night I had the honor of speaking at the Angel of Hope ceremony. 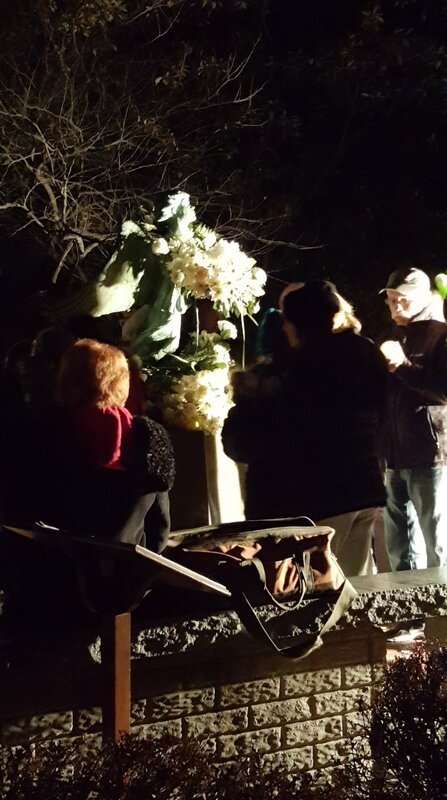 The beauty of hundreds of people holding candles and laying white flowers around the Angel of Hope statue in honor of their children who have died was breathtaking. I am thankful to have remembered my three babies and give words to our glories. has been taken from us. in the day of the living. instead allowing our hearts to hear for us in the silence that can stifle us. as our hearts will forever speak you. holy every day and always. and who we could have been. even in our endless longing. with whatever grace we can muster in that day. within the arms of lifelong loss. and unwavering hope we can find our truth. Our truth to live our lives in pure honor of you. that grief has tried to plunder from our souls. of what we must carry with us always. as we parent you from afar. through which we are forever changed. and yet choosing to be always healing. of our eternal love for you and the darkness of grief. we breathe glory into our lives. The glory of our love for you.